The three-day long 1st State Level Tribal Film Festival kicked off on Sunday at the auditorium of Tribal Research Institute (TRI) in Imphal. The film festival is being organized by State Level Tribal Film Festival Committee, Manipur under the theme ‘Striving for Excellence’. Former Deputy Speaker of Manipur Legislative Assembly, MK Preshow Shimray graced the occasion as the chief guest while social worker Thangjamang Haokip attended the event as guest of honour in the opening ceremony. In his welcome address, organizing committee chairman, Dr Gairiangmei, said the primary objective of the tribal film festival is to secure unity and peace among different communities in the State through films. Dr Gairiangmei also said without peace nothing can flourish, adding, ‘poverty, violence, conflict and other forms of tension are still part of tribal life’. “Therefore, tribal films and performing arts are still at the nascent stage. The film producers must work hard and should strive for greater heights”, Gairiangmei said. 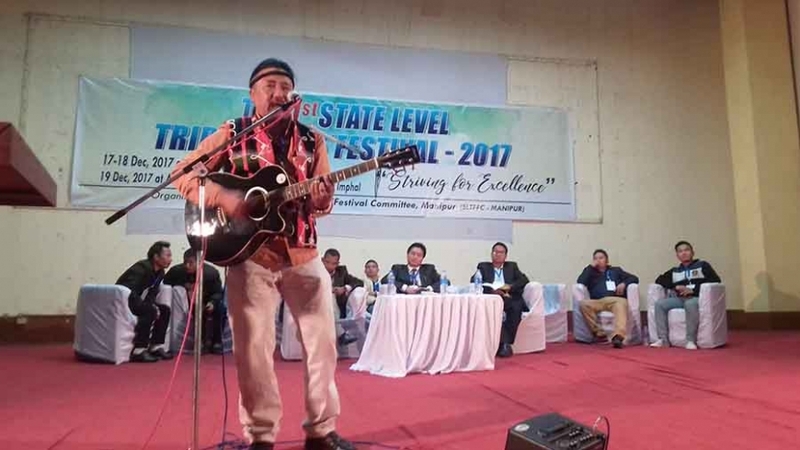 Speaking on the occasion, former Deputy Speaker of Manipur Legislative Assembly, MK Preshow Shimray pointed out that tribal peoples are talented in the fields of singing, dancing and speaking. “This kind of festival will definitely push up smaller communities which provide opportunity to showcase their hidden talents,” Preshow said. He also said that many young talented artists can take advantage of this festival and make a strong society by motivating and educating the people on what directors and producers want to give the message to the public through films. “Even though we have rich culture and folklores we are yet to explore and preserve them,” Preshow said. He appealed to those associated with the craft of film making to record the rich tribal heritage of the state. Preshow further appealed the tribal film directors and producers to focus on the tribal folklores so that the world community will come to know of the rich heritage of the tribal people. Also speaking on the occasion, social worker Thangjamang Haokip said that the socio-economic, tradition and culture are reflected in the films of a region. “Through this medium which is a powerful mass communication tool, we can tell the stories of the rich culture, tradition, distinctive characters of tribal life and share the type of narratives that shifts the perception of how the world view the tribal people”, he added.